After releasing over 20 albums Building on the success of their last two albums, "Coup De Grace" (2010) and "Ghost Of Graceland" (2016), which were both released after the band's reunion in 2006, (check also out RockUnited.com's THE STORY OF TREAT (1982-93). 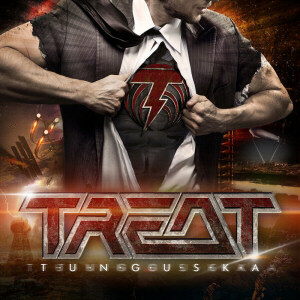 Treat's return has been more than welcome by fans and critics alike. What is "Tunguska"? "The album title is a reference to a mysterious large explosion that took place in Siberia in 1908, but metaphorically and artistically, 'Tunguska' represents the last piece of the puzzle to be put in place since the band's reunion", says guitarist, producer and founding member Anders Wikstrom. "It highlights the unique musicianship we have developed together over the years in the creative songwriting process, but also illustrates how we want our albums to sound and feel in the 21st century. We managed to dig deeper into the lyrical content, and musically the dynamics in the songs and production are more distinct as we let heavy, raunchy stuff co-exist with the softer side of the band." "Tunguska" was once again produced by respected writer/producer and longtime Treat fan Peter Mansson together with Anders Wikström. 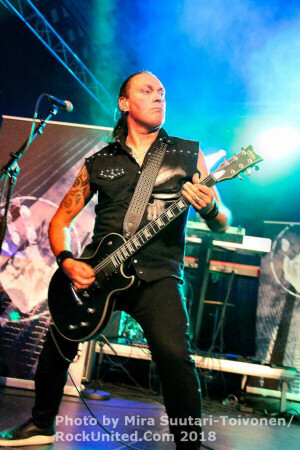 Treat's current line-up includes Robert Ernlund (vocals), Anders Wikström (guitars, backing vocals), Patrick Appelgren (keyboards, guitar, backing vocals), Jamie Borger (drums) and Pontus Egberg (bass). Here to answer some Q's, Anders 'Gary' Wikstrom. Your new album is entitled 'Tunguska' can you explain the meaning behind this? Not even the so called "experts" knows what happened in Siberia in 1908. It's not a concept album? No, It´s not a concept album, It´s an action packed Treat album, all moods included, with a cool title! These days I pretty much know the bands strength and what works for us to perform together, so I try to capture a song idea with great grooves and riffs and melody, but also a lyric content that is both timeless and autobiographical, in a sense, I think Tunguska has all of that and feels as a great Treat album should. I find it easier to write especially lyrics these days, I´m better at collecting song ideas and demos, to be made into songs, ever since I build my own studio. For instance, 'Rose of Jericho' is a metaphor for a person or any living creature that there is always hope and a way to grow and resurrect again. What kind of input did record company, friends, fellow musicians have during the recording process? The band is the captain of the ship, The record company has input on the songs we record and of course our producer has a big vote in the process. The fans are the judges in the end. We put a lot of pressure in the making process on ourselves, to make the best possible music we can, and hopefully people and fans will like it. Regarding sound and production. I just wanted this album to sound and feel groovy and easy to separate instruments and moods. The playing on this album is better than ever from every band member and that makes the songs come alive even more. Kinda like a no production thought, but capture the bands true sound and performance. I´m pretty updated technology speaking, nothing over fancy, it´s all up to performance and experience in the studio. The secret behind a good production? All of the above, but also knowing what a serves a song the best when putting it together, every now and then, a new angle to a song arrangement can do wonders as well. Looking back at your 80's/early 90s. Any best/worst moments and how would you describe your business relationship with Uwe Block? I would say both good and not so good at times. 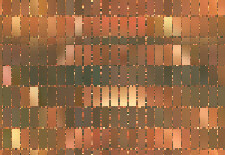 On one level I liked him a lot. He had a big heart and wanted the best for us, on the other hand he was like a kid with big dreams. I had the chance to reconcile a bit with him, when he got me in touch with the Gotthard guys in 2004 and we started a very fruitful collaboration on 3 albums. Regarding best and worst moments in the history of Treat? Too many to mention here. I´ll save it for the book:-)) Seriously I can´t name a specific worst moment and I´m still waiting for the Best!! If there's anything you'd like to add, say, please do! As you all can see, Treat is back again with ”Tunguska” which we feel are completing the trilogy of new albums since we reunited and we sincerely hope our old and new fans will like it as much as we do. We´re gonna be on the road for a while with this album as we cut the last tour a little shorter to be able to write a new killer album instead. Hope to see you all on the road, wherever in 2018-19!